The real estate bubble – or housing bubble – is a type of economic bubble that occurs every so often in local and even global real estate markets. The bubbles are caused by rapid increases in the value of housing until they get to unsustainable levels, and that’s when the values begin to decline. Believe it or not, bubbles in the housing market are even more critical and closely watched than bubbles in the stock market because real estate markets have much longer boom and bust periods. There is also much controversy over whether or not these bubbles can be identified and prevented. Many say that they cannot and should not be prevented – they should only be monitored and cleaned up after a burst. Much debate takes place over this issue and is constantly pushed back and forth to both sides. 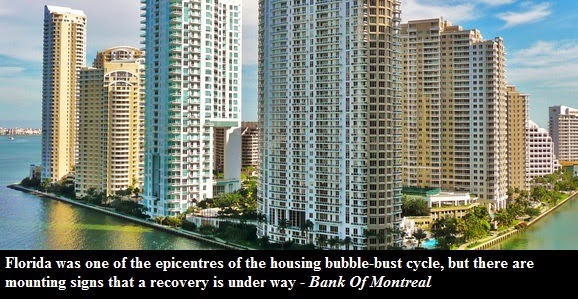 So what causes a bubble in the US housing markets? Observers and analysts blamed the 2001-2006 housing bubble and its 2007-2010 collapse on everyone and everything from mortgage underwriters, investment banks, rating agencies and investors to low mortgage interest rates, and relaxed standards for mortgage loans. Some even believe that mortgage standards became too lax because of moral hazard, which occurs when a party takes high risks because the costs won’t be felt by those taking the risks. The topic is always up for debate. Now, let’s look at the status of Florida’s real estate market after the housing bubble collapsed in 2008. Cape Coral on Florida’s Gulf Coast took quite a hit, and it led the entire nation in the number of foreclosures. It was rare to find a neighborhood that hadn’t been hit by the bubble burst in 2008. However, in 2009, things started to turn around a bit. Agents started to see some recovery with sales picking up and inventory going down. Homes were selling for less than half of their value, which encouraged first-time homebuyers with good credit to take advantage and purchase a home. Prices eventually began to flatten and even rise in some areas. Conditions in Florida still are not perfect, and a lot of cities are still affected by the burst, but in years since the collapse, there has been a slight upturn in the market. Most recently in the first quarter of 2013, the market has seen an increase in closed sales, even more pending sales, higher median prices and a reduced supply of homes for sale compared to the same quarter in 2012. The increase hovers around 10 percent. This is great news. Townhouse-condos sales are also up about 3-4 percent from the same quarter last year. Pending sales have increased a whopping 13 percent compared to a year ago, while the statewide median price for townhouse-condos is up 18 percent. All-in-all, the status of Florida’s market is in an up-swing. Again, it is difficult to monitor and prevent bubbles, but analysts constantly work to gather information after a bubble bursts to prepare for another. If you’re in the market for a new house, speak to your real estate agent about options that are right for you in order to get a good price and examine the current market trends. This post was written for Toronto Housing Bubble by Stephen K Hachey. Stephen is an Tampa Foreclosure Lawyer specializing in loan modifications, short sales, foreclosure and much more. He is also the owner of his own practice, the Law Offices of Stephen Hachey, PA. This article is for general informational purposes only and does not establish an attorney-client relationship. Please contact a licensed attorney in your state of residence. For more information on our services, please visit our website at www.floridarealestatelawyer.org.